Negroponte at AAAS: fighting electronic device "obesity"
Nicholas Negroponte of OLPC fame gave the final keynote at the annual AAAS meeting yesterday according to this piece by Wired Science. 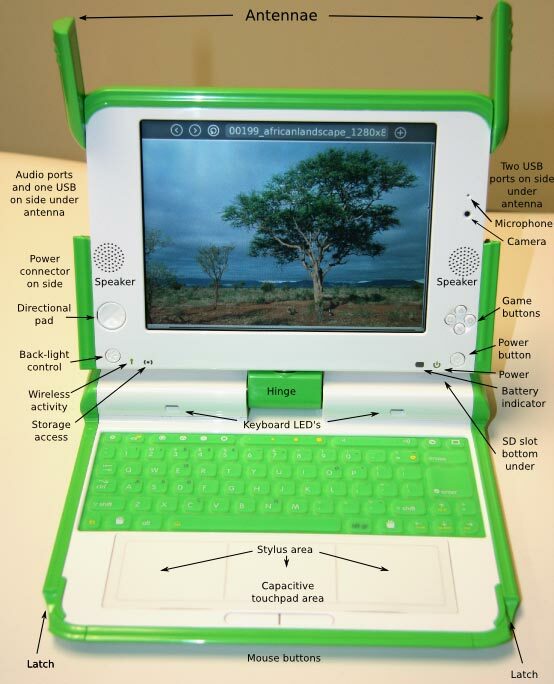 OLPC is the One Laptop Per Child program that hopes to provide these simple but sturdy XO laptops running an open source operating system to school children in countries just beginning to invest in devices and wireless infrastructure to support education. He's predicting that the XO laptop will drop in price to $100 by the end of 2009, and then to $50 by 2011. He's basing this on the price of the electronic components dropping as Moore's Law (the number of transistors that can inexpensively be placed in an integrated chip doubles every two years) continues to be in effect for the newer products. It's interesting that there is no mention of economies of scale being the major factor driving down the price as I thought was the original plan. Originally, the XO was touted as a $100 laptop hoping that commitments from countries such as Nigeria or Libya to purchase millions of units would make this price point possible . So, as we all know, electronics manufacturers fatten up cell phones with cameras and MP3 players, etc. Negroponte termed this problem, "a general obesity in the electronics industry." He went on to say, "Most laptops are like SUVs. You're using most of the energy to move the car, not the person." He's saying that the XO needn't be "fattened" with new features to maintain its utility, and it's overall price will drop over time for this reason. This is analogous to the term "feature creep" used to describe later versions of software with features added to prompt an upgrade even though these might work against the simplicity or stability of the program. In his keynote he hinted at some deals in the works: " Over the next few weeks… there'll be partnerships and changes with companies that can start rolling this out." After all, the whole idea is for these laptops to be produced and distributed at low cost across the globe, even if the production isn't being managed by OLPC. Competitors are already looking at this market, notably Intel with its Windows-based Eduwise laptop. This device goes against the plan for the children teach themselves how to use an open-source operating system, and would require teachers to formally instruct the students on how to use Windows. This is the subtitle to an article in The Economist which uses the OLPC project to illustrate the easy acceptance but poor penetration of new technologies in emerging economies. Richard M Stallman (popularly known as rms), the founder of the GNU project and President of Free Software Foundation was in Southern India this January. On his regular advocacy tour, he gave talks in different locations where people thronged to get a glimpse of him and hear what he had to say about issues relating to free software. Stallman says that he would consider using an OLPC to replace his Thinkpad. He says that the OLPC is a way for people to use the free BIOS (basic input/output system software). The free software community don't have a widely available free BIOS. I very much enjoyed this MP3 discussion among Cory Doctorow, John C. Dvorak and Steve Stecklow with moderator Leo Laporte on the OLPC phenomenon and its competition with other manufacturers including the notorious fight with Intel. There was general agreement that once you get to see the XO in person, you're hooked. Cory's idea was to fund a program that would distribute these laptops to children locally to create virality here in the US as a way of promoting interest in this project. Towards the end of this discussion, Leo mentioned his sponsor Audible.com which leads to a lively debate on the problem with DRM they use on their audiobooks. Cory describes how he un-DRM'ed his vast collection of audiobooks. Actually a little lighter than plum, more of a burgundy (there's also a blue version). According to Peter Rojas, it's just a minor improvement over the 700p. Yeah, it's a tiny bit thinner (0.8-inches vs. 0.9-inches) and lighter (5.6 ounces vs 6.4 ounces) and they've finally lopped off that antenna which has been missing from Windows Mobile-powered Treos for a while now, swapped the SD card slot out for a miniSD card slot, and added a nice, soft finish (we're not feeling the burgundy, though you might), but otherwise everything's about the same. It's the same version of the Palm OS (version 5.4.9), same screen size and resolution (320 x 320 pixels), same wireless radio (EV-DO Rev 0, not even a bump up to Rev A), same Bluetooth (1.2, you'd think it'd kill 'em to upgrade to 2.0), same 1.3 megapixel camera, same battery life, same processor (312MHz XScale), same amount of memory (128MB of RAM), etc. You get the picture, and to be fair, Palm makes it pretty clear with the model number that this isn't meant to be a major upgrade. As far as major improvements in a Palm products are concerned, there are those rumors about a Palm UMPC coming out this month. Available for $280, middle of May, with one of those two-year ball & chains. The NYTimes' John Markoff is reporting on the release this morning of information relating to Intel's new Mobile Internet Device (MID) line of connected handhelds (that may or may not be considered UMPCs), in the context of "Intel’s effort to achieve drastic reductions in power requirements for future portable computers." The article quotes an Intel chief executive who promises a ten-fold reduction in power consumption with these processors by the end of the decade. One reason Intel is pushing its version of the wireless hand-held computer is that the market for data-oriented cellphones and wireless palmtops is now dominated by a competing chip standard controlled by ARM, a British microprocessor design firm. Intel hopes that by creating another class of devices independent of the cellphone market, it can displace the ARM-based hand-helds. It hopes to build support for its version of the hand-held computer in China based on partnerships with producers like Lenovo and Acer. Battery life is a major issue with UMPCs, especially when you expect to use WiFi connectivity much of the time. Later this week, according to many prominent sources, Intel will be announcing their new line of Mobile Internet Device (MID) UMPCs at their Intel Developer Forum in Beijing. They will not run Microsoft's Origami implementation. The Ultra-Mobile PC (abbreviated UMPC), previously known by its codename Project Origami, is a specification for a small form factor tablet PC. It was developed as a joint development exercise by Microsoft, Intel, and Samsung, among others. Current UMPCs feature the Windows XP Tablet PC Edition 2005, Windows Vista Home Premium Edition, or Linux operating system and low-voltage Intel Pentium or VIA C7-M processors in the 1 GHz range. You can see from this chart, the MIDs will offer a range of 4" to 6" displays, will support open and proprietary platforms, will boot into a "simplified" UI compared to Windows allowing an instant-on (although another slide gives an 18-second boot time) user experience with an embedded Linux OS. It also shows that the intended users for the MID would be consumers and prosumers, as opposed to higher-end users, suggesting a much better price point for these devices. 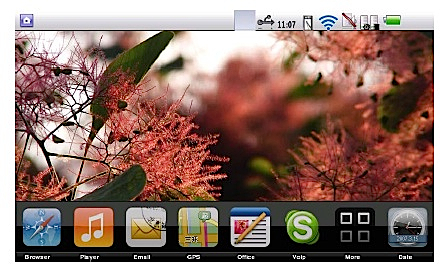 Connectivity will be supported with HSPDA and WiFi. Comparisons to the iPhone are being made already, with some noting the similarity of icons used on the MIDs. Certainly, with the MID's advanced connectivity options over the iPhone, it might be a better option for those seeking an converged device for clinical use. Ben Ames of InfoWorld is reporting the growing expectation that Intel will annouce a new UMPC (ultra mobile PC) platform at its developer forum in Beijing Monday. Intel is set to announce at its IDF (Intel Developer Forum) conference starting Monday in Beijing that it will launch a new UMPC platform called McCaslin using a Stealey microprocessor running at 600MHz or 800MHz and capable of supporting Microsoft's Windows Vista OS, according to several technology blogs. The "one-kilogram wasteland" refers to the awkward market space of UMPCs "with neither the long battery life of smartphones nor the fast processing power of laptop PCs." There have beens hints of this announcement for months, says Ames, sparked by the news that Intel said it would collaborate with Microsoft's Origami software platform. They did a quick hands-on with the UX50, a micro PC. They reported typing a little difficult. Also, screen resolution at 1024 x 600 for the 4.5 inch LCD is a somewhat challenging considering the UMPCs use 800 x 480 on a 7 inch LCD.